I know... I know... I've been totally MIA. After Christmas I was BEAT and with all the holidays, family visits, kids being home on vacation and my son's birthday party I needed time to just STOP doing all the "things". Every day off since November was spent decorating, prepping, entertaining, cleaning, shopping and I needed a break from all that! I love the holidays and I love spending time with my family but I seriously needed "me time". Since the whole family has been home these last two months every room in the house was filled with the sounds of either Christmas music, YouTube videos, video games or Zumba music. Every where I went in my house there was a person there, LOL. I was done "personing". I just wanted to sit in bed all day alone and do nothing but surf the web and watch Netflix. I know, I sound like a grouch. Don't get me wrong, I absolutely love company and obviously I love having my family around but every now and then I need to be alone to recharge. And recharging is what I did and now I feel so much better. ♡ I'm back and ready to socialize! During my little hiatus, my wife came across a "for sale" ad for a chesterfield sofa that her friend put on Facebook Marketplace. She texted me as soon as she came across it. I was like HELLLL NO! THIS AIN'T GONNA HAPPEN! I'm not glam!!! I'm dark, moody and masculine! 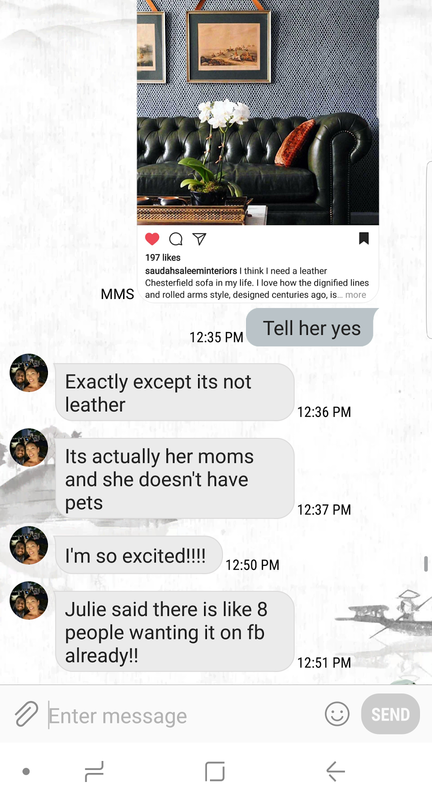 If that sofa ends up in my living room I'm going to end up having a personality disorder a' la Sally Fields in "Sybil"
I remembered that I fell in LOVE with a beautiful picture of a green leather chesterfield sofa that I saw on Instagram. It didn't look UBER feminine or glamorous. The green chesterfield was eclectically styled with a classic and masculine vibe to it. MAYBE THIS CAN HAPPEN! Once I remembered that picture I WAS SOLD! The chesterfield sofa on sale wasn't green leather, but it was a nice neutral grey that I could definitely add green throw pillows to if I wanted that punch of color. And the best part was the price. Ready for it??? So now the chesterfield is here in our home and we are living with 2 full-sized sofas. Since our place is relatively small, I didn't think we could comfortably fit two full-sized sofas in the living but it actually works and our family is really enjoying it! So now I feel like keeping both of the sofas! I was planning on selling the old one, but I'm having second thoughts. Maybe the two can work together or nah? I'm thinking the couches are way too different to look balanced. I'm opened to your suggestions! Let me know what you think in the comments! I can't wait to style up the chesterfield so you can see it's full potential! I promise to show it off soon! I love the two sofas and it could be a fun game to style them to work well together. Yeah and I'm thinking it would be fun having two different styles of couches to photograph :) . I'm glad I haven't sold the old one yet. Maybe I'll live with it for a while and see. Thanks! Oh gosh I love all the stuff!! Maybe I should just keep it for a while until I get tired of it. Thanks for your suggestion! Hey, so glad you asked! Awesome find! OMG I LOVE that sofa!! It is beautiful and looks beautiful in your space. That being said if you don' t want it I will gladly take it off your hands!! You are in San Diego right? I'm in El Centro. We can make this happen!